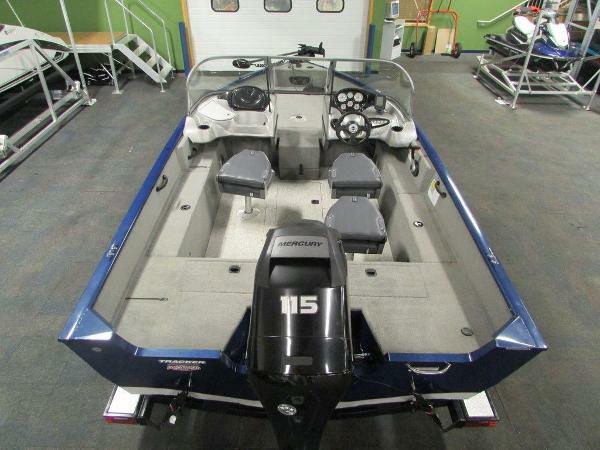 2013 Tracker® Boats Pro Guide V-175 WT CLEAN 2013 TRACKER V175 PRO GUIDE WALK THRU WITH ONLY 74 ENGINE HOURS! A 115 hp Mercury 4-stroke EFI outboard powers this aluminum deep-V fishing boat. Features include: MinnKota Powerdrive V2 55 lb thrust 12-volt trolling motor, Lowrance X-4 Pro fish/depth finder, full walk-thru windshield, passenger console w/lockable glovebox and cooler w/drain, gauges including; tachometer, speedometer, water pressure, trim, voltmeter, and fuel; Jensen AM/FM stereo w/AUX and USB, 12-volt power outlet, navigation/anchor lights, electric horn, bilge pump, raised bow fishing deck including; trolling motor plug, 12-volt power outlet, trim switch, in-floor rod storage w/rod tubes, trolling motor battery storage, aerated livewell with manual/auto fill and recirc, and large storage compartment; cockpit vinyl floor, drivers seat w/slider, (2) movable swivel fishing chairs w/6 in-floor seat bases, port and starboard cockpit storage compartments, port top deck rod tie-down bungees, cockpit in-floor storage, raised stern casting platform including; storage compartment, aerated livewell w/manual and auto fill, and removable bait bucket; passenger safety handles, beverage holders, (4) mooring cleats, fire extinguisher, marine cranking battery, deep cycle trolling motor battery, 21-gallon fuel tank, stainless skeg guard, and 5 person carrying capacity. Also included is a TrailStar bunk trailer including; swing tongue, swivel jack, 14” wheels, spare tire carrier (spare tire not included), diamond plate fender steps, transom saver, side centering bunks, tie down straps, and bearing buddies. This boat is in excellent overall condition with minimal wear and only 74 hours. There are minor cosmetic scuffs/scratches on the exterior and graphics and minimal carpet fade (see pics/video). It has been inspected by our factory-trained technicians and is mechanically sound. Trades will be considered and delivery is available. Competitive financing rates and terms are also available. Approximate payment of $219/mo. w/20% down for 120 mo. (WAC). Leaders RPM is one of the largest marine and powersports dealers in the Midwest with over 70,000 sq ft of showroom, parts, and service under one roof located in Kalamazoo, MI. Price is plus sales tax/fees and is subject to change without notice. Super clean one owner boat. Always kept in my garage and stored indoors in the winter. Comes with everything in the photos! 17' 6" long by 6' 9 " wide. Customized and recarpeted in 2005. Changed to a new 115 Johnson in 1996. 1994 8 HP Evinrude kicker with 3 gal. gas tank. Gas tank fits perfect in the back compartment. Both engines run great. 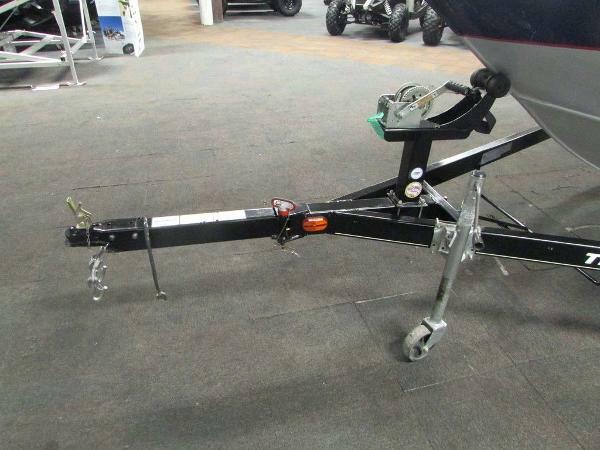 2008 Shorelander bunk trailer. Lowrance LCX38 locator with GPS. Front and rear 12 volt trolling motors. 2 livewells. AM/FM/Weather/CD stereo with 4 speakers. Marine band radio and antenna. 3 - 12 volt batteries, 2 were new in 2017 and 1 is a 2013. Guest 20 amp 2 bank onboard charger with easy plug in receptacle. 7 - rod holders. 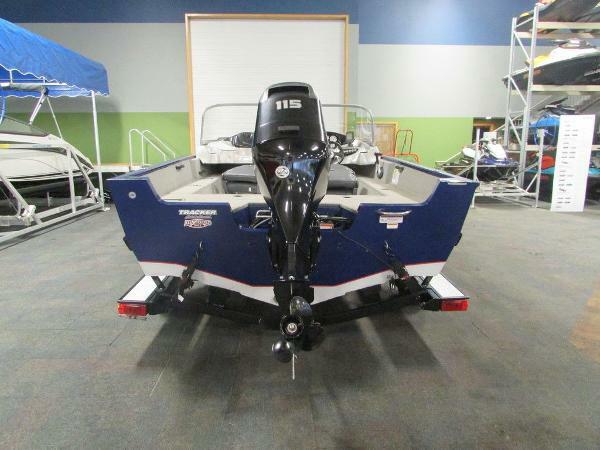 This boat is ready to fish and ski/wakeboard !! !